The MCR320-QP (Quiet Power™) is an extreme-duty liquid-to-air heat exchanger designed to be used with three 120mm fans, and specifically engineered for high-end liquid cooled Personal Computers. The Quiet Power™ technology is the result of months of research and development focused on optimizing thermal performance and audible noise characteristics with low to medium airflow types of fans. The MCR320 -QP series heat exchangers have been engineered to meet today's PC industry highest thermal loads, quality standards, and low noise requirements at competitive prices. 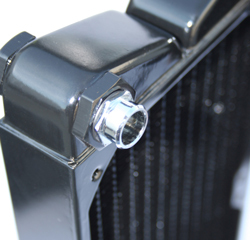 * MCR320-QP: The "classic" form factor features inlet and outlet ports located at the top of the radiator. * MCR320-Res: The upper plenum serves as a reservoir and features a fill-port; inlet and outlet ports are located at the bottom of the radiator. * MCR320-QP Stackable: using the "classic" body, the upper plenums feature two inlet and outlet ports opposite to each other, thus allowing to stack radiators together. This the perfect upgrade for existing owners of MRC320-QP radiators in search of Extreme performance. Key to the feasibility of this series, we also developped the ultra-short 1/2" barbs that are necessary to link the radiators. Four of these fittings are included with the MCR320-QP-STACK. Triple 120mm fan form factor triple the surface area available for convection of the heat into the air compared to single 120mm fan designs. The Quiet Power design yields superior performance at low noise levels compared to competing products in the same class. Optimized for 120mm fans with low to medium air output. The added heat dissipation capacity enables multiple high-end devices (multi-core CPU's, and SLI systems) to run highly overclocked at the lowest possible noise levels. Flat brass tubes and copper louvered fins, with brass plenum chambers and frame construction, for optimum thermal conductivity. Fin density optimized to reduce air noise. Flat frame surface provides optimum seal to the fans. Built-in plenum chamber. The MCR320-QP and MCR320-Res can be installed using Swiftech's MCB120 "Radbox".